My niece is a senior and last weekend was her final appearance in her studio's yearly original ballet. I wanted to make her something special for the occasion. 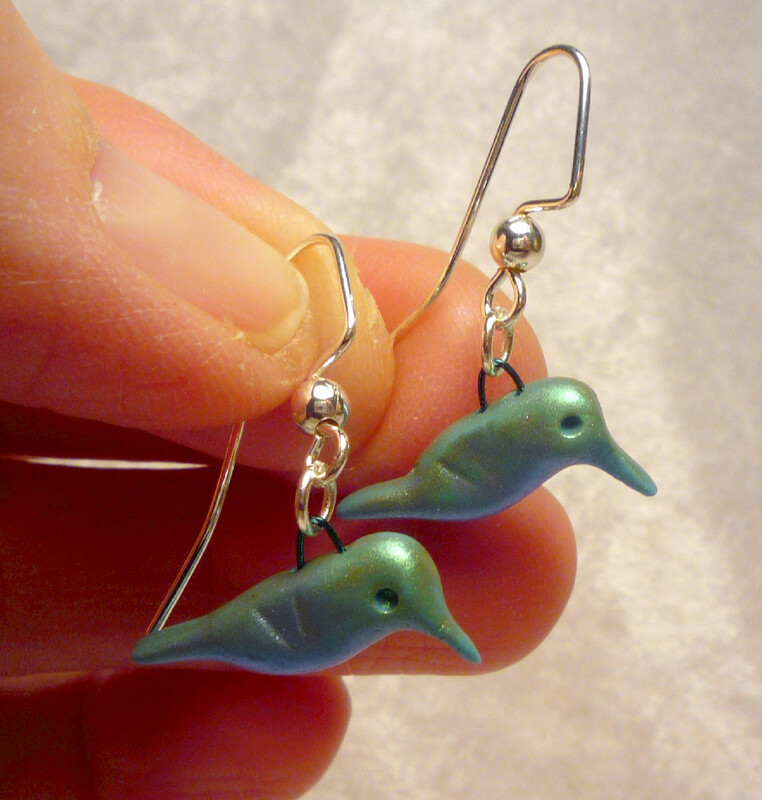 She loves peacocks, but I wasn't sure how to make small peacocks that would look light and airy enough for earrings. Then I thought of hummingbirds. 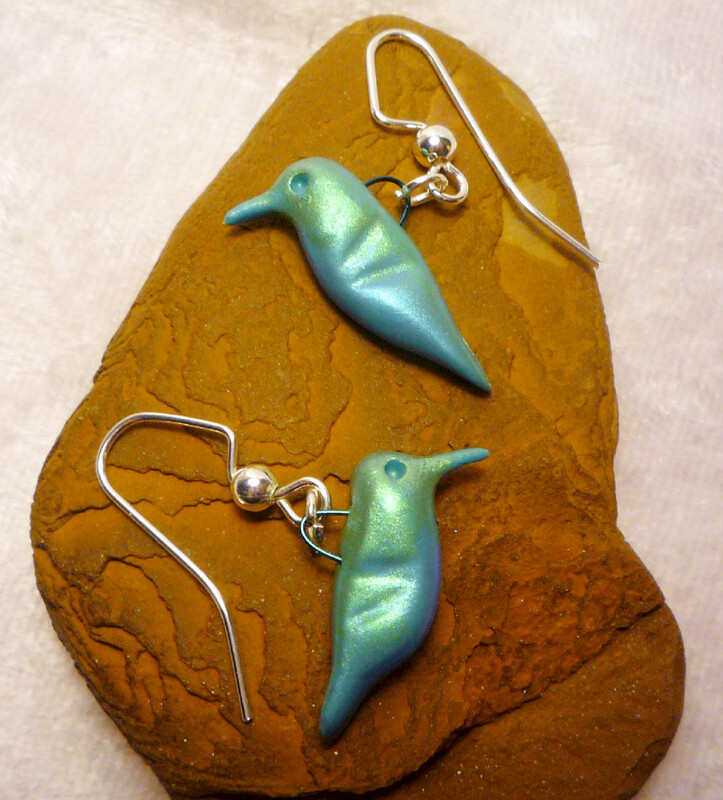 Hummingbirds come in a variety of jewel-tone colors, so I knew I could use similar iridescent blues and greens, even purples, and they would make wonderful earrings. 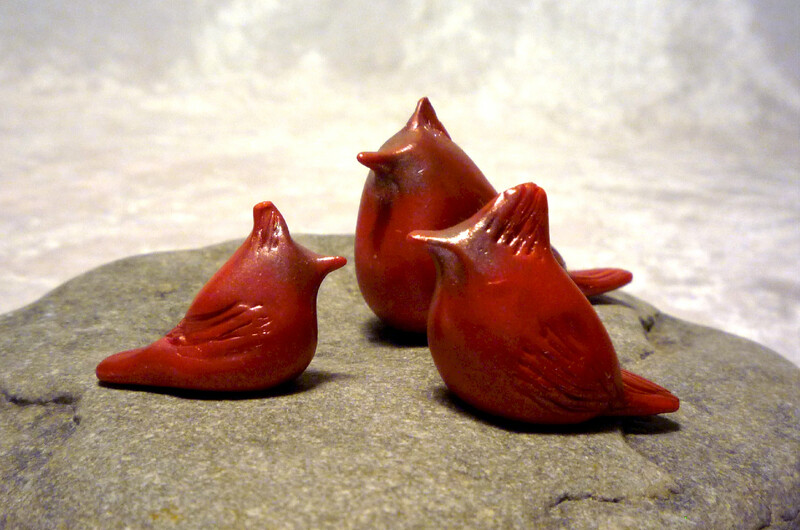 The only problem that I could see was the fragility of the tiny birds in polymer clay. The beaks would be bad enough, but what about the wings? And how to make them appear delicate and give the illusion of movement? After some thought, I decided to stylize the tiny hummingbird sculptures, and use texture for the wings, instead of actually sculpting them in polymer clay. When hummers fly, their wings move so fast they become a blur to the eye anyway. I made a few pendants and a couple of pairs of earrings in this manner, so that I could put some in my Etsy store as well. I am very happy with the results. The pictures really don't do them justice, and my niece loved her earrings, which I presented to her after the ballet in lieu of flowers. I have been sculpting a lot of different kinds of birds and some animals, even a few fantasy animals, for a few months now out of polymer clay, then listing some of them on my Etsy store, which I launched on New Year's Day this year. Among my pieces, I have goldfinches, cedar waxwings, white doves, Baltimore orioles, bluebirds, a couple of foxes, sea serpents, phoenixes, even a few garden slugs. And of course, cardinals. Who knew, when I listed the various cardinals, that they would be the only items that would sell? So far, anyway. I've had three sales and one commission piece, and ALL of them have been cardinals. Three figurines and a pair of earrings. (Well, four figurines. One sale was a pair) They are very popular birds, apparently. And two of the people who wanted a cardinal figurine said the cardinal would remind them of their fathers. I think it is interesting. I ordered some business cards with my artwork on them today. It just occured to me that perhaps I should have picked one of my cardinal pieces for the cards, instead of my crow trio, the ones I blogged about in my first post. But I don't regret it. I like the crows, and they need a chance to shine as well. I am pleased with my choice, and some day I hope that someone else will feel the same way, and want to own something I make that isn't a cardinal. 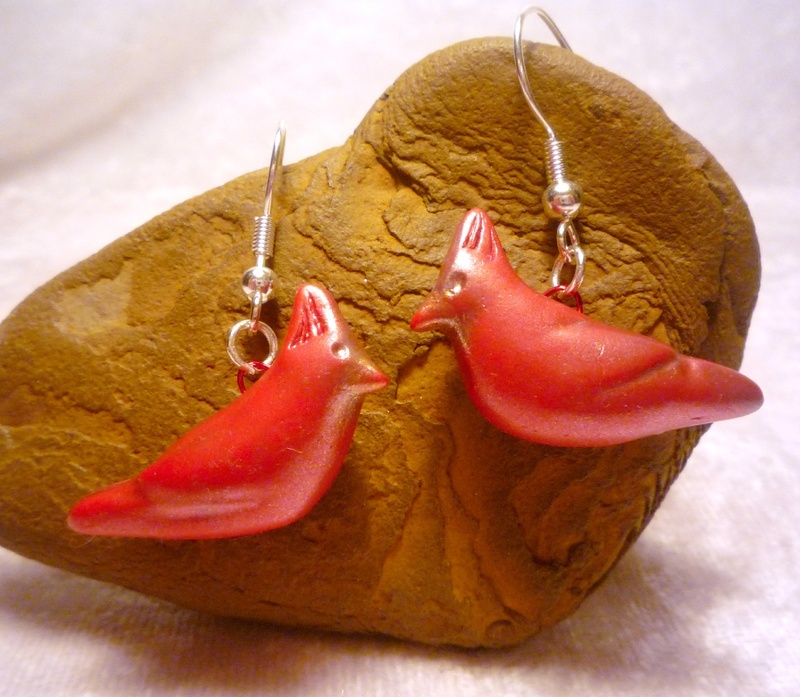 In the meantime, I am happy that people like cardinals, and I hope they enjoy the ones I make. 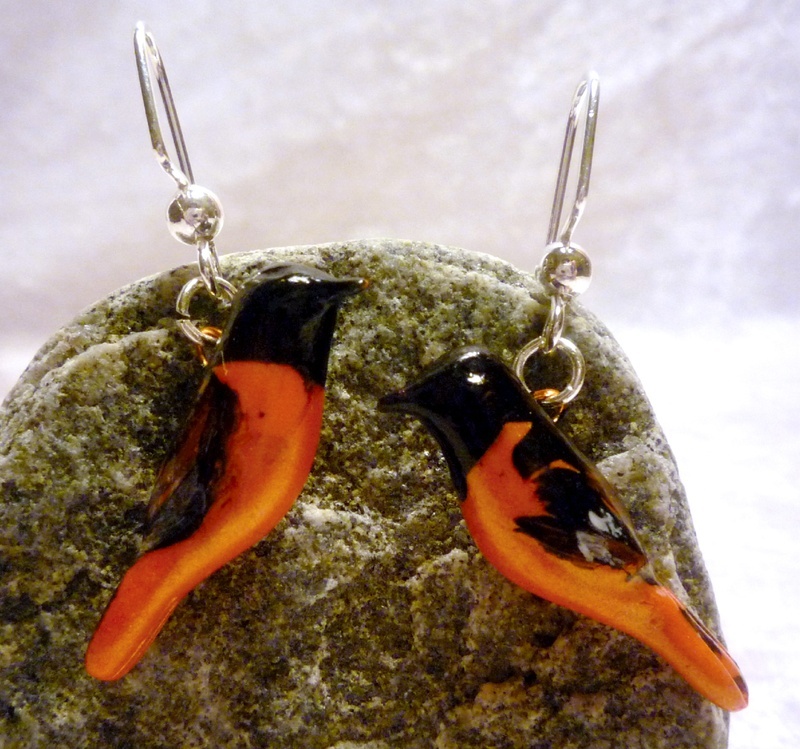 I had some cheerful, bright orange polymer clay that called out to be shaped into Baltimore oriole birds a week or so ago. Finishing them was a bit trickier than expected, however. 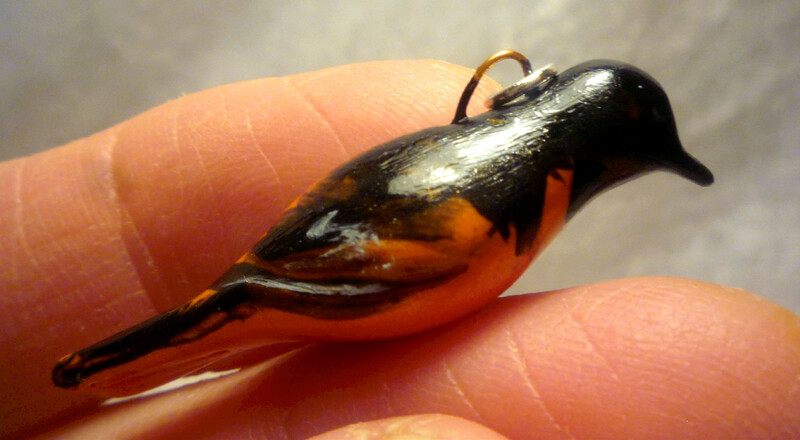 The carbon black Pearlex powders turn out to be too messy to use for details, especially on tiny little pieces, so I had to use black paint for the markings on these birds, after they were baked. They have a touch of white on their wings as well. Even though my birds are stylized, and not meant to be exactly true to life, I think they still need the right colors in the right places. I also varnished them, to make sure the black paint didn't chip or rub off with use. 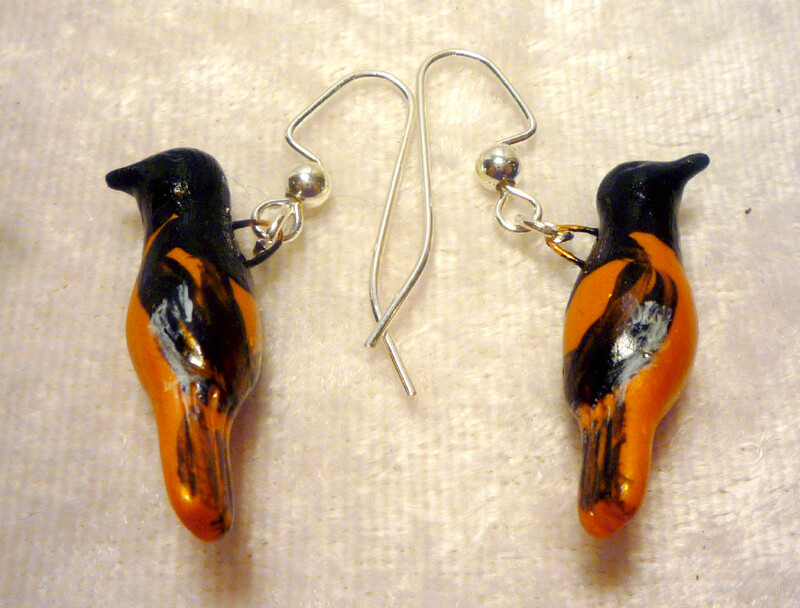 The four smallest birds I made into two pairs of earrings, and the two larger were left as pendents or charms. I have listed the earrings on my Etsy store today. After I made a few little green sea serpent or water horse figurines, I liked them so much that I made two pairs of tiny sea monster earringsand listed them on Etsy. Loch Ness Monster earrings, how unusual! I think they are cute, and I wish my ears were still pierced so I could wear them. I like variety much more than turning out the same thing in the same style, so these little Nessies are in different positions. In one pair of earrings, the sea serpents' tails are curled around, more like a snake. The other pair looks more like the typical pictures of sea serpents, in what I call inchworm style. Which one do you like better? I can't quite decide. Cardinals are in this month, I guess. My very first sales ever, one from Etsy and one to my cousin via facebook, were both cardinals. 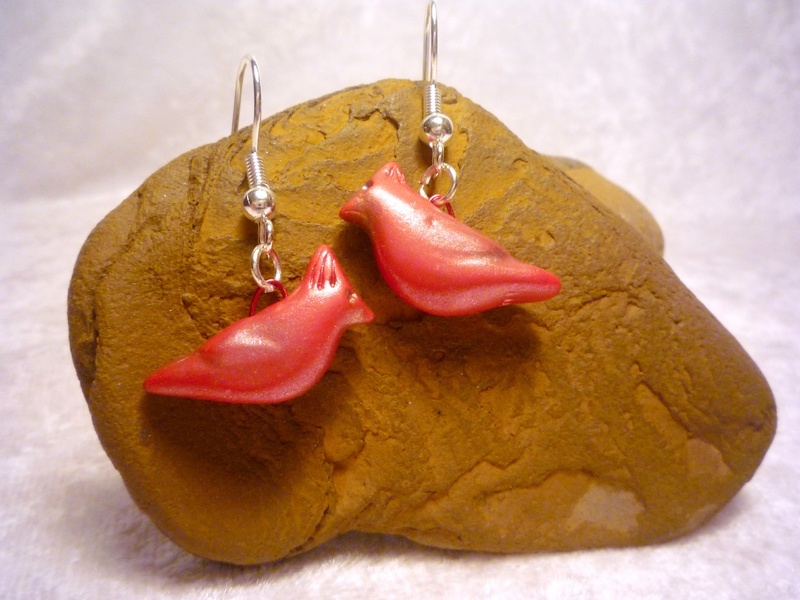 My cousin bought the pair of tiny cardinal earrings for a Valentine's Day present for his wife. Very sweet. 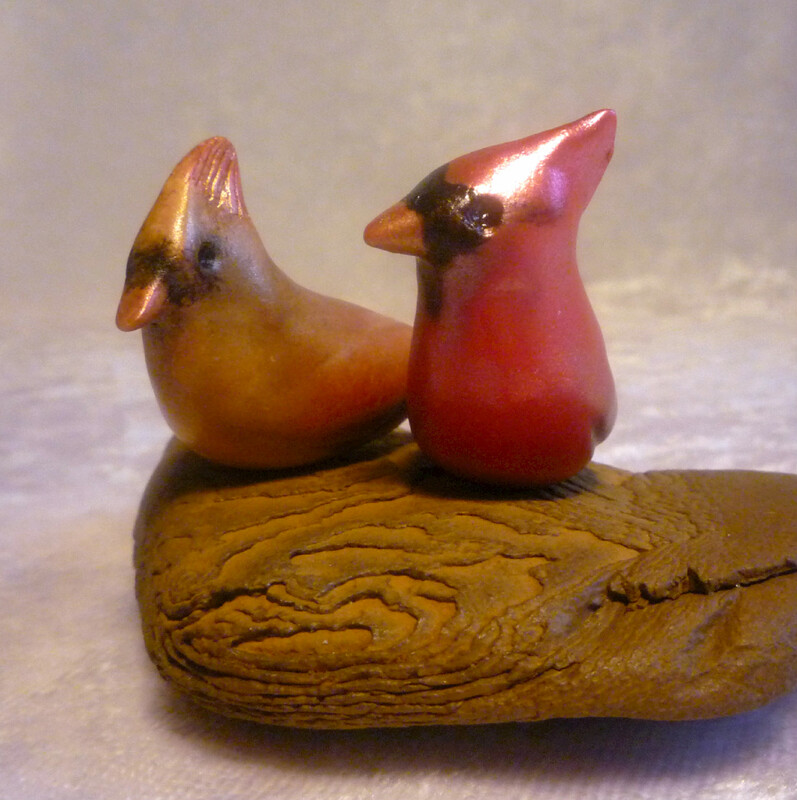 The Etsy purchase was a fat little cardinal figurine that a man bought for his wife's birthday. Today I had to figure out how to package and ship them both. It was a happy chore. I gift-wrapped both pieces in red paper with a tiny silver bow. Unfortunately, by the time I got the packages addressed and ready to go, it was five minutes after 5:00 p.m., and the Post Office was closed. I will have to mail them first thing tomorrow morning. Next time it should be easier. By next time too, I want to have a supply of boxes on hand, little boxes for the piece itself, and bigger ones for shipping. I would like to have a stamp made with the Touchstone Creations logo on it so the inner boxes will be marked with my shop name. Perhaps I will make the stamp myself out of polymer clay.